Breast Tomosynthesis, 3D Mammography allows radiologists to examine breast tissue one layer at a time. Breast tomosynthesis is a new technology in the fight against breast Cancer, provides the radiologist with more information to find cancers that are otherwise buried in breast tissue and reduces the need for additional imaging. Traditional mammography is flat or two-dimensional (2D), the images can be hazy, and this makes it hard to detect early signs of cancer. 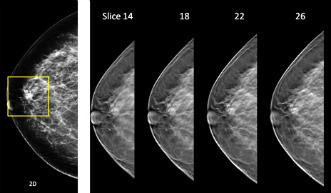 Breast tomosynthesis, 3D mammography uses high-powered computing to convert digital breast images into a stack of very thin layers or “slices”—building what is essentially a “3-dimensional mammogram”. During the examination, the low dose X-ray arm sweeps in a slight arc over the breast, taking multiple breast images in just seconds. A computer then produces a 3D image of your breast tissue in one millimeter layers. Now the radiologist can see breast tissue detail in a way never before possible. Instead of viewing all the complexities of your breast tissue in a flat image, the radiologist can examine the tissue a millimeter at a time. The tissue is more visible.